Salesforce announced significant enhancements to its AppExchange Partner Program earlier in May including a $100 million Salesforce Platform Fund to encourage developers of AI-driven solutions as well as changes to its partner business model. Salesforce was arguably the first kid on the block with a partner program of this kind in which buyers could access a large community of apps based on a single standard from a single store. It’s worth remembering for instance that the AppStore was a Salesforce property that Marc Benioff gave to Steve Jobs when Apple announced its store. At the time it seemed like Benioff’s respect for Jobs got in the way of a good business decision but history shows it was a shrewd move. An AppStore, as Apple has managed it, replicated a traditional hierarchical retail model. But Benioff’s next iteration, the AppExchange, was a closer approximation of the give and take of a bourse, a software bourse if you like, in which we are all potentially buyers and sellers. Salesforce partners are just as likely to incorporate other partners’ apps in their offerings as well as selling their own. That’s the better model and the idea that Salesforce has carefully nurtured and updated this week. But platform is not limited to customer facing apps. The number of ERP or back office-like apps like Financial Force and others like Xactly for incentive compensation management on the AppExchange gives ample evidence to support the wisdom of supporting any business application with a platform and that’s why the AppExchange and the partner program that animates it are so important. My poster child for platform-based apps is a company called nCino, which specializes is bank operations and has a great story to tell about business loan origination. They’ve managed to winnow a seven-week manual loan origination process down to ten minutes or less demonstrating not only the power of their apps but the power of the platform to enable the flexibility needed to do the job. That’s not exactly CRM or is it? The point is that the platform and the partner program have come into their own because they enable business leaders to imagine their businesses with far fewer limits to their creativity. Consequently, the Salesforce Partner program had been successful but it was also up for some retooling. New automation helps partners onboard quickly and automated information dissemination makes it easier than ever to get the information you need to fine tune a business. On the other hand, automated learning systems embodied in the Trailhead program make it easy to train up a workforce to go after platform opportunities. Training might be the key to everything else for Salesforce because the learning modules are available to anyone regardless of whether they are employed by a partner. I’ve seen estimates as high as 350,000 job openings for people with Salesforce skills. Self-paced learning systems are a fine way to reach some markets. Surprisingly, the announcement also put a number on the size of the ecosystem and it wasn’t small. At $389 billion, the Salesforce Economy dwarfs the parent company’s revenues and concretely demonstrates the value of leveraging the Salesforce1 Platform. At this level, there’s room for many partners selling complementary apps or even apps that have little or nothing to do with CRM. Recently at CRM Evolution I spoke about business agility and the importance of platform-based applications to support it. The logic is simple. Apps support processes and platform, which contains components that make applications modern like workflow, analytics, collaboration, and journey mapping. Building all of these components into a customer-facing app is both hard and tedious; in my opinion you can’t have an agile business if you need to stitch all of this componentry together by hand, hence the value of a platform. The Salesforce announcement also provides some technical fixes to the partner program that any vendor will need to make from time to time. New partner pricing and algorithms to score a partner’s business along four dimensions are now in place including customer success, product success, team readiness, and giving back. What would a Salesforce program be without an effort to give something back to the world? Salesforce is also lowering the baseline percent-net-revenue (PNR) model for all new AppExchange Partner Program partners from 25 percent to 15 percent. In all, these tweaks help to reinforce the bourse model of the partner program. Virtually all partners start small and the changes will support that. Some partners stay small because of the niches they’ve adopted. But other partners like nothing better than to get big and the changes made to the program will help all of them and Salesforce to address that $389 billion channel opportunity. At the same time $100 million in startup funding should ensure that the pipeline of emerging companies remains full. Spreadsheets suffered a body blow when Salesforce announced new platform functionality last week. Soon all spreadsheets will be good for is financial analysis. This sounds funny because the spreadsheet has for several decades been the unofficial IT prototyping tool. Actually, it was the end user prototyping tool, the default thing they used to capture data when IT was famously too busy maintaining the legacy systems they got from a spaghetti factory. But with the introduction of Lightning Components, Lightning App Builder, and AppExchange for Components, it’s now easier to build your prototype app with these tools than it is to build a spreadsheet. Salesforce glommed onto lightning terminology as a way to convey the idea of fast development and because it sounds so much better than blitz. The idea in total reminds me of object oriented programming from 30 years ago but with much less emphasis on tedious coding and libraries. Salesforce has brought to market tools that can take a back seat to your creativity and rather than obsessing about how to do some technical trick, the developer, or increasingly the end user, can think about the business need. It’s as fundamental as an artist mixing a color without giving it a lot of conscious thought. That’s what’s happening here with components. Let us unpack. Ok, so the really cool thing to me is that components will become another category in the AppExchange. They can be built by anyone and if they can be built they can be bought and sold. Of course you can spend a week building one yourself but having the functionality available on the AppExchange for pennies (ok, whole dollars) will make everyone think twice when making build vs. buy decisions. Components come together in the Lightning App Builder a place (I believe they refer to it as a canvas in keeping with my art analogy) where a developer goes to assemble (I think they say compose) the business app. I suppose you could think of the canvas as a blank spreadsheet if that helps. But the difference between a spreadsheet and a functioning app is huge. It goes without saying that unlike a spreadsheet, a Lightning app has a real database behind it. And as usual with Salesforce, apps built on the platform inherit all of the other Salesforce capabilities like workflow, Chatter, and security schema and everything else. A few years ago you could look at the mountain of legacy code and wonder how it could ever be rewritten for handheld devices or replaced to take advantage of all the new capabilities coming on stream. Those capabilities are substantial because, more than the transaction-oriented applications that are rapidly being replaced, they focus on various aspects of process. Thus the answer to the how question above has two parts. First, we aren’t going to replace those transaction systems, we will supersede them with process support that goes wider and deeper, made possible by pre-built components and subsystems. Second, we will do this because the market demands it. No one is waving a flag to that effect but I don’t think you can be in business in a social, mobile, big data world any more and not know that if you can’t leverage those things you will need to find a new job. Finally, and also in answer to the how question above, all of this is now possible because we have the ability to generate apps replacing man-centuries of work in hand coding. With this as the fuel of business innovation, I am excited to contemplate where it takes us. How many euphemisms are there for divorce? We’re still good friends. It was mutual. Time to move on. Whatever. It happens all the time. In business, relationships form and dissolve faster than last week’s nuptials in Vegas. Companies do what’s best for them and their shareholders and that’s the way it is. But we don’t do business in only three dimensions. Reality has a fourth dimension that we frequently forget about, time. We live and work in time and at some point we fall out of time and that’s known as the big siesta, Dylan Thomas’s long good night. The fourth dimension isn’t simply a small house at the end of a long road, it is the road and how you get to that house. I have been musing about time recently as I noticed that Marketo is no longer mentioned on the AppExchange though they were once a poster child. At the AppExchange you can search on Marketo and get a lot of marketing automation vendors but not that one. It is curious and conspicuous by its absence. 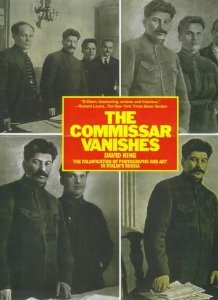 The disappearance reminds me of a coffee table book, “The Commissar Vanishes,” which is a collection of before and after photos of Soviet era officials. When someone fell out of like with Stalin, the party would crop or airbrush the individual from the photo in an effort to remove him from history. “Importantly, for those of you that are also Salesforce.com customers, there will be no change in our strategy and support for our best in class integration with Salesforce.com’s CRM platform. As recently as this year, Salesforce.com customers have rated Marketo as the best marketing solution, continuing a five-year streak of similar affirmation from the Salesforce.com customer base. We see no reason that the recent news should change our leadership position among Salesforce.com customers or in the marketplace at large. Our integration is built using Salesforce.com’s public web-services API’s and open Force.com interfaces. Salesforce.com – as all modern cloud companies must be – is committed to maintaining an open platform, for us, for their AppExchange partners, and most importantly for you their end customers. Marketo is deeply committed to ongoing support and continued innovation of our products for Salesforce.com customers. As a business decision, taking Marketo out of the AppExchange makes sense but only tactically for Salesforce’s CRM business. For its platform business, it makes no sense at all. If Marketo was the only example then it might not be such a big deal, but try finding Yammer on the AppExchange, as another example. You can Google Yammer and Salesforce or Marketo and Salesforce and see plenty of hits for the two together but not on the AppExchange. To the extent that Salesforce wants to be the go-to platform for application development and social business process enablement it doesn’t make any sense that they would bar competitors to their marketing products on their platform’s marketing site. Taking down Marketo or Yammer or any of the other products that compete with its own products is a warning sign that the platform side of the house is not agnostic. You might say that there are plenty of alternatives to Salesforce’s marketing solutions and they are still represented in the AppExchange but that only makes singling out Marketo seem more out of focus, not less. As Salesforce is still in the process of building up the utility computing market, this seems like an unnecessary and self-inflicted wound. Perhaps the two companies are still friends but it doesn’t look like this divorce was mutual. This post is part of an occasional series on the AppExchange as Salesforce.com celebrates the seventh anniversary of its launch. The series will focus on some of the most interesting AppExchange applications of the last year. KnowWho is a great example of a long tail application made possible by the AppExchange. It’s a database service for companies and non-profits that do business with federal, state and local governments and contains accurate and up to date information about elected officials and their staffs that supplements the business processes enabled by Salesforce CRM. When we think of CRM and sales force automation (SFA) many people immediately think about selling products in the private sector. But in the public sector selling often involves championing ideas and informing and convincing elected officials is a key part of the democratic process. Obviously, corporations may seek to inform an official or a staff member responsible for staying abreast of an issue. However, this need also extends to the non-profit sector as well. Various trade associations and NGO’s (non-governmental organizations — like the Red Cross for example) and the like have a need to identify and communicate with officials to convey their ideas and information. Elections constantly change the landscape and staff changes happen in government just as they do in the private sector and that’s where KnowWho provides a valuable service. The company maintains data on a list of 145,000 state, fed, county, local, government officials and their staffs. KnowWho has a staff of 28 editors keeping the information up to date — 5 just to monitor congress — and record and distribute data changes which the company founder and CEO Bruce Brownson says reach 1,500-2,000 changes per week. But the real importance of the database is that it informs the Salesforce SFA system, which enables users to pursue their agendas to efficiently inform government officials about issues. Subscribers to the database import the data into their Salesforce instances where they can make additional notes, schedule calls, record pertinent facts about meetings and perform the same actions that any other user would. KnowWho is not the first company to conceive of this idea. Government data and lists have been popular for a long time. But earlier versions of these services relied on weekly distribution of CD’s or other media and rather tedious synchronization processes. Using Salesforce.com and the AppExchange as the distribution system enables KnowWho to circulate data much faster than older approaches. More importantly, the Salesforce CRM solution provides an efficient application for making use of the data within a sales process. The whole government database business has advanced and become more complex than simple distribution. Today, companies and other entities that seek to influence public officials must keep meticulous records of their activities and be able to report on them. For these purposes, Salesforce CRM along with the modifications that KnowWho has made — such as a Lobbyist Activity tab —provide the ability to capture encounter data and produce reports of all activities for legal compliance. KnowWho has produced an interesting and useful application and service for a highly specialized market segment. This is a classic long tail application that the AppExchange is ideally suited for. It is also a proof point for the flexibility of the Force.com platform and the notion that if you can conceive of an application, you can build it and take it to market using this ecosystem. Bracket Labs is a good example of a native AppExchange company. Founded in 2010 in Boulder, CO, Bracket is dedicated to making simple and powerful applications that enhance the Salesforce user experience. Their native Salesforce Platform apps improve business processes and operate across traditional functional areas of business and CRM. The two products in market at the moment include TaskRay an app for project management and a shared marketing calendar for managing Marketing Campaigns. Don’t be fooled, these apps are not simply reincarnations of paper based management systems. Both incorporate Chatter functionality and leverage data captured in the Salesforce CRM system. So, for example, TaskRay is useful in a project management situation but instead of relying on paper based Gant charting techniques, the system leverages Chatter to determine what part of a project demands the most attention now and which elements can be done in sequence later. Chatter captures input from the team involved at every point in the process and through collaboration and drag and drop techniques users prioritize effort and solve challenges ensuring that the project is managed to goal. This approach gives TaskRay a flavor of what Salesforce often refers to as a “scrum,” in which the needed people and resources converge on a problem and participate in creating a solution and then leave to do something else that’s equally important. Using Chatter ensures that the team will have a full record of the process in the Salesforce feed and Chatter also provides a convenient platform for sharing documents and other files needed to support the project. Campaign Calendar does much the same for marketing projects. The company likes to say that Campaign Calendar helps users to visualize the campaign through calendars and timelines that are color coded for easy reference. It then supports team collaboration and campaign management through Chatter and by capturing and managing the campaign details. This helps the team to share everything about the project or campaign and provides a concise history of the campaign. TaskRay and Campaign Calendar are two examples of long tail applications. In this case, neither is hard to conceptualize and many companies have built their own versions of these systems in spreadsheets or loose paper files. But neither of those approaches make it easy to maintain communication within the group and they can waste time and resources through inefficiency. Until the AppExchange and the Salesforce Platform came along however, there was no good and affordable way to automate these processes. But with the Salesforce Platform, this type of application is easy to make and maintain. These applications save a great deal of time and resources by making information sharing easy and that’s one of the most important benefits of long tail applications.